If you want to find an antelope, you'll need to focus your search on Africa and Asia. The North American pronghorn isn't really an antelope, but is related to antelopes and goats. Africa hosts 71 species of antelope and 14 varieties live in Asia. They're all in the Bovidae family. Antelopes are found throughout Africa and parts of Asia. Since they're herbivores, they're often found on grassy plains and savannas. Some species live in desert regions and a few prefer dense forests. They congregate in herds, with the herd size ranging from small—about three to ten animals—to massive groups. The specific habitat, food availability and time of year can affect the size of the herd. A few antelope, such as the duiker species, prefer solitude or live in pairs. Some species of antelope migrate for food, so home is ever-changing for them. African addaxes follow the rain and travel great distances to dine on new plant growth. Thomson's gazelles trail migrating wildebeest and zebras, eating the tender shoots the other animals leave behind. Species in forested areas usually don't migrate, but antelopes living in open areas do. Antelopes living in closed habitats, such as reedbucks, are usually small to medium-size, allowing them to move through the undergrowth of home. These guys tend to have a rounded back and short legs, allowing a quick start and dodging run to escape predators. Antelopes living in open habitats are medium-size to large, and rely on grass for food. Built for speed, these animals have space to try to outrun attacking prey. Vulnerable antelope calves have two choices to survive: they can travel right after birth with the herd's protection, or they can avoid predators by hiding. 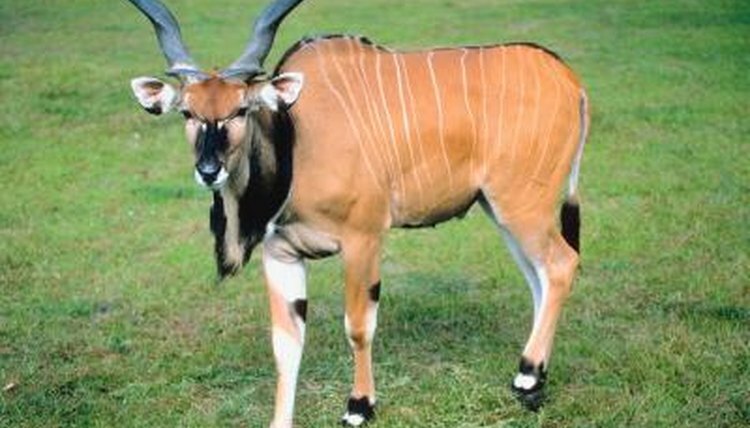 Most, such as elands and roan antelope, choose to hide. The mother will move the calf when it's strong enough to hide among bushes, rocks, long grasses or thickets. Mom rejoins the herd, periodically returning to feed the baby, who stays hidden and silent. When the calf is strong enough, which can be after a week to a month, depending on the species, it joins the herd.